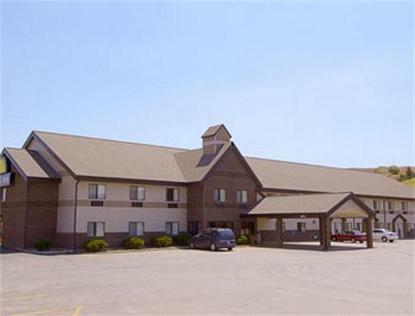 Our beautiful new hotel is centrally located to summer and winter activities in the Black Hills area, nationally renown Passion Play old historic areas and museums, as well as a Veterans Hospital. Easy off-on access to Interstate Highway 90 with shuttle service to major airport 40 miles away, Historic Deadwood, featuring gambling entertainment. We offer a smile and clean rooms with full cable television and HBO, continental breakfast from 6:00AM to 10:00AM, with coffee available anytime in our homey and spacious lobby, where you can curl up in front of our fireplace, or relax in our Jacuzzi just a few feet away. We offer AARP discounts to our senior guests, AAA, ICC, SDC, Government, as well as commercial discounts. A restaurant, lounge, gift shop featuring beautiful Black Hills Gold, gasoline and mini-mart are within walking distance.